I created the concept of sustainable happiness to foster well-being for all. We have an extraordinary opportunity in education to enhance sustainable happiness for ourselves, our students, society, and the ecosystems that sustain us. Education for Sustainable Happiness and Well-Being will take you on an inspiring discovery of how this is possible. You will explore the connections with positive education, innovation, creativity, entrepreneurship, sustainability, and health promoting schools. Dr. Catherine O’Brien has been actively engaged in sustainability efforts locally, nationally and internationally for more than 25 years. As a participant in the Global Forum of the 1992 Earth Summit, she served as a co-coordinator of the alternative Debt Treaty that was forged by non-governmental organizations from around the world. Her doctoral research at the Barefoot College in Rajasthan, India explored its pioneering work in education for sustainable community development. Catherine is an education professor at Cape Breton University (CBU), Canada where she developed the world’s first university course on sustainable happiness based on the path breaking concept of sustainable happiness she created – integrating sustainability principles with positive psychology with the aim of fostering well-being for all, sustainably. The course is an elective in CBU’s Bachelor of Education program. 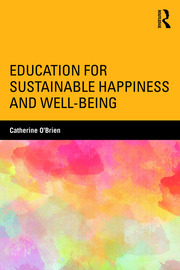 Catherine has also developed a teacher’s guide that applies sustainable happiness to health education outcomes for every Canadian province with an international version for educators outside of Canada (It is also available in Spanish and French).